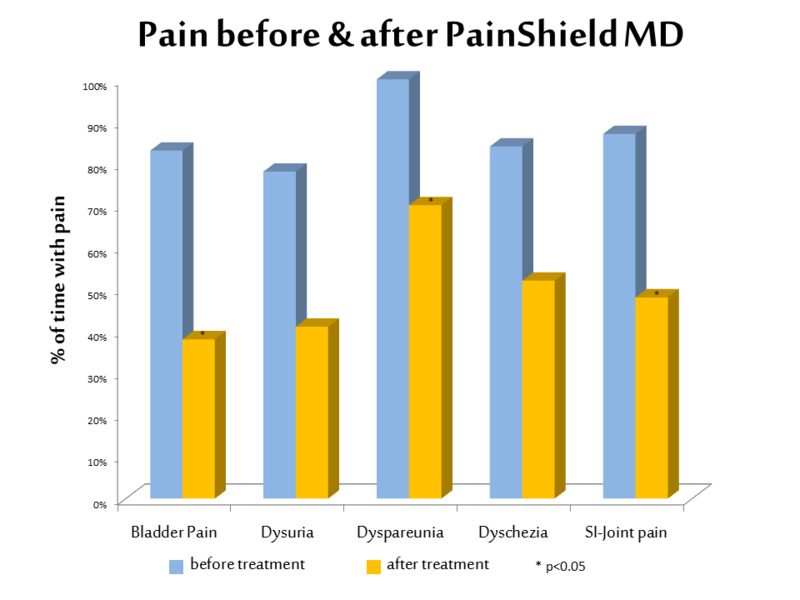 We have now followed up patients using PainShield MD for 17 months, with excellent results as documented in the clinical study below, which was presented at the Annual Meeting of the International Pelvic Pain Society in Orlando, FL Oct. 17-19, 2013. #2 "Reduction of Chronic Pelvic, Urological and GI Pain Using Wearable Therapeutic Ultrasound in Women with Extended Follow-Up to 17 Months"
Click on one of the thumbnails above for clinical data. Objective: To assess the efficacy of a wearable low−frequency, low intensity ultrasound device in treating pelvic and related pain up to 17 months. Methods: In this open−label, prospective study, 16 women (age 47, 33−62) diagnosed with endometriosis (31%), adhesions (69%), bowel obstruction (44%), IBS (31%), interstitial cystitis (25%) other CPP (63%) or prior hysterectomy (69%) were treated for pain using PainShield®MD (NanoVibronix, Nesher, Israel). These patients were part of a cohort that included 3 male patients previously followed up to 207 days. Worst, Least and Average scores (0-10) from before and up to 190 days (1−541) after treatment were compared by the Wilcoxon Signed Rank test. Results: Improvements (* p<0.05) were noted in most scores for Worst (W), Least (L) and Average (A) pain (median before/after treatment) for dysuria (n=6), (W=4.5/2.0*; L=0.0/0.0; A=2.5/1.0*); pain on full bladder (n=10), (W=5.0/3.0; L=2.5/0.0*; A=4.5/1.0*); pelvic or abdominal pain (n=10), (W=9.5/6.5*; L=2.0/0.0; A=5.5/3.0*); dypareunia, during (n=11), (W=10.0/5.0*; L=2.0/2.0; A=4.0/3.0); dyspareunia, after (n=8), (W=7.0/2.5*; L=1.0/0.5; A=4.5/1.5*); dyschezia (n=8), (W=7.0/3.5*; L=0.0/0.0; A=3.0/2.0*); rectal pain (n=3), (W=10.0/6.0; L=3.0/0.0; A=6.0/3.0); SI Joint pain (n=10), (W=9.5/7.5*; L=3.0/0.5*; A=6.0/3.0*); sitting pain (n=10), (W=8.5/8.0; L=1.0/1.5; A=4.5/5.0); other musculoskeletal pain (n=13), (W=8.0/5.5*; L=2.0/1.0; A=6.0/5.0). Reductions in the % of time (before/after) with pain (Student’s t test) were also noted for pain on full bladder (83/38*), dysuria (78/41), pelvic or abdominal pain (84/61**), dyspareunia, during (92/68), dyspareunia, after (100/70*), dyschezia (84/52**), rectal pain (53/18), SI Joint pain (87/48*), other musculoskeletal (77/63). Onset of relief was reported to within hours or days after starting treatment often with a reduced need for analgesic or other medication. Overall patients rated their response as Negative (1/16), Mild (4/16), Moderate (2/16) or Good (9/16). The one patient responding negatively reported a rapid onset (< 1 day) of pain which rapidly subsided. One patient responding well reported abdominal discomfort. Both patients reported similar reactions to conventional ultrasound. Conclusions: These findings extend those described previously in this cohort from up to 207, now to 541 days of treatment, confirming the utility of PainShield MD in treating painful pelvic, urological and GI pain in patients with long−standing and refractory disease. 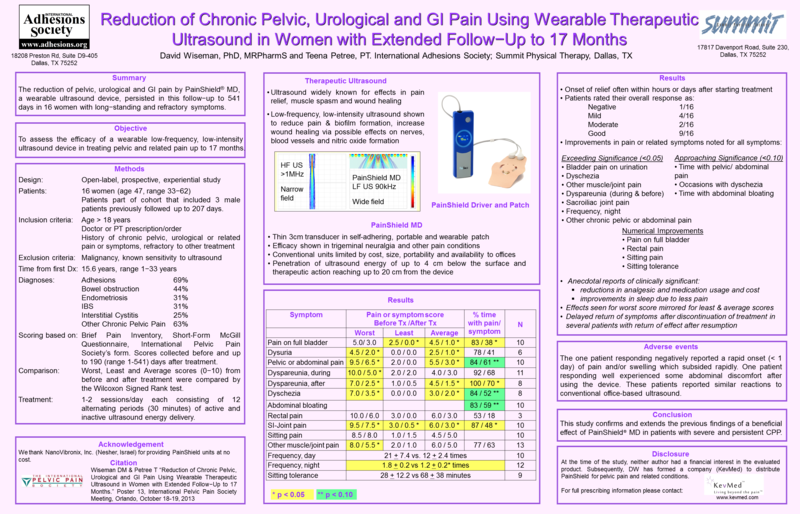 The reduction of pelvic, urological and GI pain by PainShield MD, a wearable ultrasound device, persisted in this follow-up to 541 days in 16 women with long-standing and refractory symptoms. At the time of the study, neither author had a financial interest. Subsequently, the primary author has established a company (KevMed, LLC) to distribute this device. Wiseman, DM, Petree, T., Reduction of Chronic Abdominal Pelvic, Urological and GI Pain Using Wearable Therapeutic Ultrasound up to 17 months. J Minimally Invasive Gynecology 20: S76 2013.